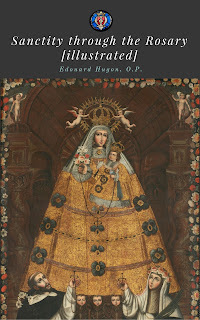 Authored by Edouard Hugon O.P., Translated by Sr. M. Alberta O.P. A small book on how the Rosary can sanctify your life. "It would be easy to develop at some length this comparison between the Sacraments, instituted by Jesus, and the Rosary, the work of Mary. To sum it up in a few words: the condition of human nature is such that it has to be led by things corporeal and sensible to things spiritual; the Sacraments and the Rosary are signs which help the soul to rise to the contemplation of God and eternity. Man wishes to feed his mind with things spiritual; he thirsts after the infinite; the Sacraments and the Rosary help him to satisfy that desire." - Preface.